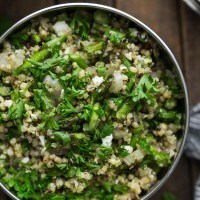 Three Grain Pilaf with Roasted Asparagus | Naturally. It’s no secret that I love grains as a base for meals but one of may favorite things is to mix grains. It’s not always the easiest given almost every grain has a different cook time but the method below is perfect. I cook the sorghum by itself then add the millet and quinoa. The sorghum adds a nice chewy texture while the millet and quinoa add more heft. This grain pilaf with the roasted asparagus should go on your next picnic menu (or even a work-lunch menu). Or if you’re like me, you can just make it for a light dinner! While the grains cook, preheat oven to 400˚. Trim ends from the asparagus and cut into 1/2″ pieces. I prefer to use thinner asparagus for this, but thick asparagus will work as well. 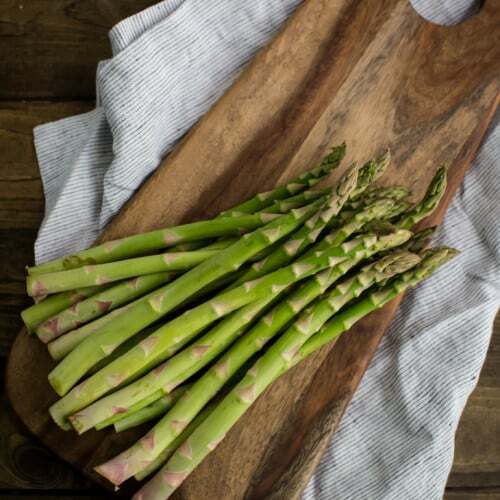 Cut the shallots into thin slices and place the asparagus and shallots in a roasting pan. Toss with olive oil and salt. Roast for 20 minutes or so, until the asparagus is cooked and starting to char. 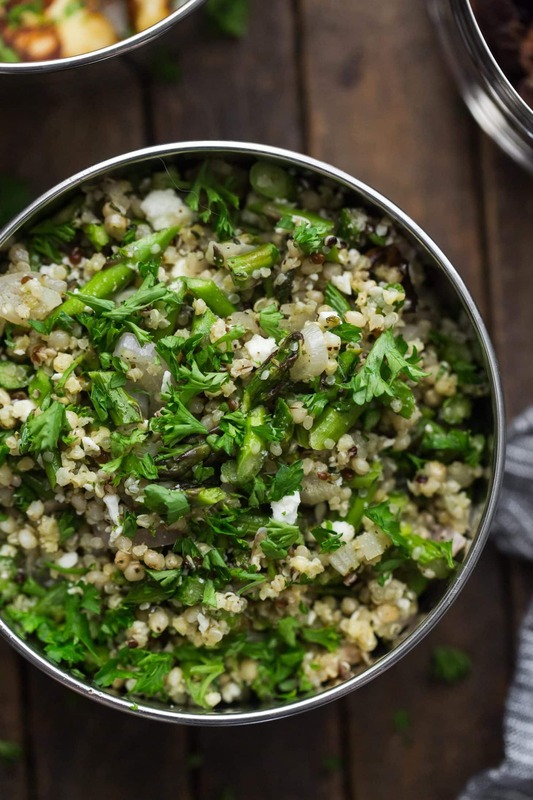 Once grains and asparagus are done, toss the 2 to 3 cups of the cooked grains with the asparagus, feta, parsley, and hemp seeds. Whisk together the dressing ingredients, pour over the grain mixture and toss until well combined. Toss and add more salt as desired. Save leftover grains for use in anotehr salad or grain bowl. I think what I love most about these types of a grain pilaf is that anything can be changed. 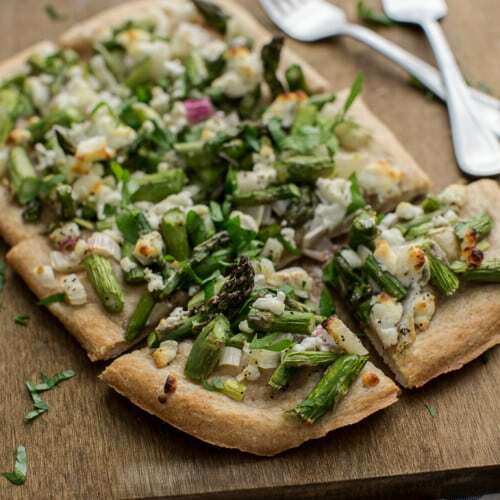 The asparagus in this is delicious but the grain mixture could be used in any season. If you already had a bit of dressing made that was your favorite, you could use that in place of the black pepper mixture and more fresh herbs are always good. 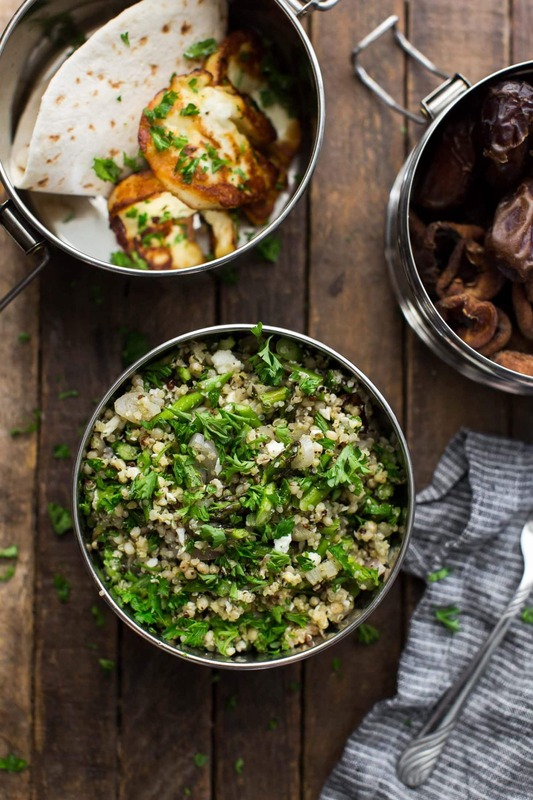 Vegetables: This grain mixture will really work with any produce. A fava or pea mixture would work in spring, tomatoes/squash in summer, or roasted squash in the fall. Vegan: Leave out the feta and use your favorite vegan sweetener in place of the honey. Nuts/Seeds: If you don’t want to buy hemp seeds; sunflower seeds or sliced almonds would be a nice, crunchy addition. This would be perfect for a picnic! I love the different grains you used too. I bet it’s delicious! I am exactly like you. Love grain-based meals, but usually cook one type of grain each time I make something. Thanks for putting me up to a new combination! I love pilaf and this looks amazing. A bit high in ingredient count but great nonetheless! I’m glad I’ve found this just as the weather has started to get warmer as looks like a great summer recipe. Thanks. I’ll definitely be trying this soon. I tried this recipe tonight, but found that the 1.5 cups of grains you call for, once cooked, made way more than what was required for this recipe (resulted in approx. 8-9 cups of grain). I wonder if perhaps the ingredients you listed were cooked grains instead of raw? I’m happy I decided only to use 2 cups of the cooked grains, as it tasted delicious and the dressing was enough to provide flavour to the whole dish. Hi Steve- So sorry about that! I did only use 2 to 3 cups of the cooked grains but reserved the rest for use in another meal (I’ve added this to the recipe). Although, it usually only makes around 3 1/2 to 4 cups of cooked grains, so the 8-9 cups seems like a lot! So glad I found this recipe. I have a bunch of asparaguses just waiting for me in the fridge. Thanks for sharing.